Feel the ALOHA spirit as you walk through the door of Dr. Stephanie Wong's office. You'll discover that the professional experience of our staff is surpassed only by their friendliness and humor. You could almost feel the lightheartedness and laughter penetrate throughout the office. Our office utilizes state of the art sterilization procedures, while creating an atmosphere that is anything but sterile. Dr. Wong is a gifted clinician and the leader of an EXTRAORDINARY Team! Our talented staff of professionals routinely receives advanced dental training on the latest equipment and treatment techniques. What sets us apart from other dental offices is our remarkable combined attitude and approach towards dentistry. We have created a dental office where we treat our patients the way we would like to be treated. Like "FAMILY"! Let us show you how exceptional dentistry and an amazing staff, can add up to "The Best Dental Experience You've Ever Had"!!! Dr. Stephanie ML Wong DMD, Inc.
Dr. Stephanie Wong is unlike any other dentist you've ever been to. The reason she became a dentist was her yearning to help and heal her patients. Her goal was to "Create Life Changing Experiences". She is also well regarded by her patients for her thoroughness. Dr. Wong truly takes the time to provide her patients with the best care possible. Rather than being rushed, you know that she is there to serve all of your needs. She takes pride in giving the best of care to each and every one of her patients, and increasing the longevity of their teeth. 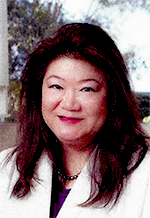 She graduated high school from the prestigious Punahou School in 1981, before receiving her doctorate in 1989 from the Washington University School of Dental Medicine. Dr. Wong is dedicated to advance, postdoctoral study and provides her patients with a gentle, caring, comprehensive approach to oral health. She is a member of Richard V. Tucker Cast Gold Study Club, American Dental Association, Honolulu County Dental Society, The International Association of Dentists, and The Academy of General Dentistry. In her free time, she used to volunteer giving "Healing Touch" to the patients at The Queen's Medical Center. Now she spends it either traveling or with her her family and friends, doing what she does best. "Living Life To The Fullest!" You can tell she loves what she does, because her patient's always leave with a "Smile"!